Several amino acids have their metabolic pathways linked to the metabolism of other amino acids. 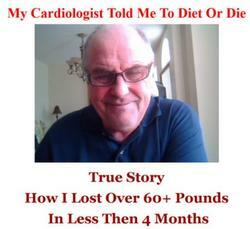 These codependencies become important when nutrient intake is limited or when metabolic requirements are increased. Two aspects of metabolism are reviewed here: the synthesis only of nonessential amino acids and the degradation of all amino acids. Degradation serves two useful purposes: (a) production of energy from the oxidation of individual amino acids (»4 kcal/g protein, almost the same energy production as for carbohydrate) and (b) conversion of amino acids into other products. The latter is also related to amino acid synthesis; the degradation pathway of one amino acid may be the synthetic pathway of another amino acid. Amino acid degradation also produces other non-amino acid, N-containing compounds in the body. The need for synthesis of these compounds may also drain the pools of their amino acid precursors, increasing the need for these amino acids in the diet. When amino acids are degraded for energy rather than converted to other compounds, the ultimate products are CO 2, water, and urea. The CO2 and water are produced through classical pathways of intermediary metabolism involving the tricarboxylic acid cycle (TCA cycle). Urea is produced because other forms of waste N, such as ammonia, are toxic if their levels rise in the blood and inside cells. For mammals, urea production is a means of removing waste N from the oxidation of amino acids in the form of a nontoxic, water-soluble compound. This section discusses the pathways of amino acid metabolism. In all cases, much better and more detailed descriptions of the pathways can be found in standard textbooks of biochemistry. One caveat to the reader consulting such texts for reference information: mammals are not the only form of life. Several texts cover subject matter beyond mammalian systems and present material for pathways that are of little importance to human biochemistry. When consulting reference material, the reader needs to be aware of what organism contains the metabolic pathways and enzymes being discussed. The discussion below concerns human biochemistry. First, the routes of degradation of each amino acid when the pathway is directed toward oxidation of the amino acid for energy are discussed, then pathways of amino acid synthesis, and finally use of amino acids for other important compounds in the body. Complete amino acid degradation produces nitrogen, which is removed by incorporation into urea. Carbon skeletons are eventually oxidized to CO 2 via the TCA cycle. The TCA cycle (also known as the Krebs cycle or the citric acid cycle) oxidizes carbon for energy, producing CO 2 and water. The inputs to the cycle are acetyl-CoA and oxaloacetate forming citrate, which is degraded to a-ketoglutarate and then to oxaloacetate. Carbon skeletons from amino acids may enter the Krebs cycle via acetate as acetyl-CoA or via oxaloacetate/a-ketoglutarate, direct metabolites of the amino acids aspartate and glutamate, respectively. An alternative to complete oxidation of the carbon skeletons to CO2 is the use of these carbon skeletons for formation of fat and carbohydrate. Fat is formed from elongation of acetyl units, and so amino acids whose carbon skeletons degrade to acetyl-CoA and ketones may alternatively be used for synthesis of fatty acids. Glucose is split in glycolysis to pyruvate, the immediate product of alanine. Pyruvate may be converted back to glucose by elongation to oxaloacetate. Amino acids whose degradation pathways go toward formation of pyruvate, oxaloacetate, or a-ketoglutarate may be used for glucose synthesis. Thus, the degradation pathways of many amino acids can be partitioned into two groups with respect to the disposal of their carbon: amino acids whose carbon skeleton may be used for synthesis of glucose (gluconeogenic amino acids) and those whose carbon skeletons degrade for potential use for fatty acid synthesis. L-glutamate + oxaloacetate « a-ketoglutarate + L-aspartate (catalyzed by the enzyme aspartate aminotransferase) which of course is also L-aspartate + a-ketoglutarate « oxaloacetate + L-glutamate and L-alanine + a-ketoglutarat « pyruvate + L-glutamate is catalyzed by the enzyme alanine aminotransferase. Clearly, the amino N of these three amino acids can be rapidly exchanged, and each amino acid can be rapidly converted to/from a primary compound of gluconeogenesis and the TCA cycle. As shown below, compartmentation among different organ pools is the only limiting factor for complete and rapid exchange of the N of these amino acids. The reversible transamination to keto acids is followed by irreversible decarboxylation of the carboxyl group to liberate CO 2. The BCAAs are the only essential amino acids that undergo transamination and thus are unique among essential amino acids. Together, the BCAAs, alanine, aspartate, and glutamate make up the pool of amino N that can move among amino acids via reversible transamination. 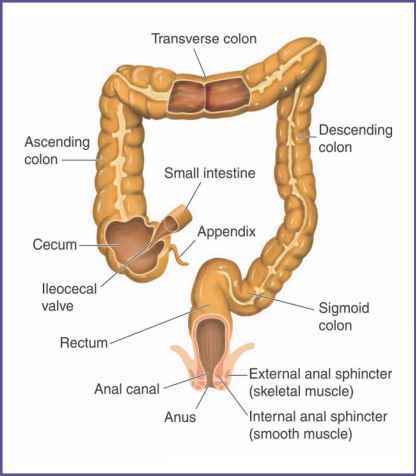 As shown in Figure..2,2, glutamic acid is central to the transamination process. In addition, N can leave the transaminating pool via removal of the glutamate N by glutamate dehydrogenase or enter by the reverse process. The amino acid glutamine is intimately tied to glutamate as well; all glutamine is made from amidation of glutamate, and glutamine is degraded by removal of the amide N to form ammonia and glutamate. A similar process links asparagine and aspartate. Hgure..2..2 shows that the center of N flow in the body is through glutamate. This role becomes even clearer when we look at how urea is synthesized in the liver. CO 2, ATP, and NH3 enter the urea cycle to form carbamoyl phosphate, which condenses with ornithine to form citrulline (Fig 2.3). The second N enters via aspartate to form arginosuccinate, which is then cleaved into arginine and fumarate. The arginine is hydrolyzed by arginase to ornithine, liberating urea. The resulting ornithine can reenter the urea cycle. As is mentioned briefly below, some amino acids may release ammonia directly (e.g., glutamine, asparagine, and glycine), but most transfer through glutamate first, which is then degraded to a-ketoglutarate and ammonia. The pool of aspartate in the body is small, and aspartate cannot be the primary transporter of the second N into urea synthesis. Rather, aspartate must act as arginine and ornithine do, as a vehicle for the introduction of the second N. If so, the second N is delivered by transamination via glutamate, which places glutamate at another integral point in the degradative disposal of amino acid N.
Figure 2.2. Movement of amino N around glutamic acid. Glutamate undergoes reversible transamination with several amino acids. Nitrogen is also removed from glutamate by glutamate dehydrogenase, producing a-ketoglutarate and ammonia. In contrast, the enzyme glutamine synthetase adds ammonia to glutamate to produce glutamine. Glutamine is degraded to glutamate by liberation of the amide N to release ammonia by a different enzymatic pathway (glutaminase). Figure 2.3. 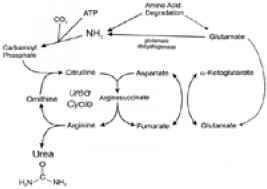 Urea cycle disposal of amino acid N. Urea synthesis incorporates one N from ammonia and another from aspartate. Ornithine, citrulline, and arginine sit in the middle of the cycle. 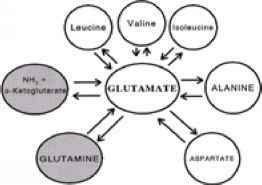 Glutamate is the primary source for the aspartate N; glutamate is also an important source of the ammonia in the cycle. 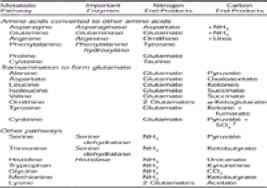 An outline of the degradative pathways of the various amino acids is presented in Table.2.6. Rather than show individual reaction steps, the major pathways for degradation, including the primary endproducts, are presented. The individual steps may be found in textbooks of biochemistry or in reviews of the subject such as the very good chapter by Krebs (17). Because of the importance of transamination, most of the N from amino acid degradation appears via N transfer to a-ketoglutarate to form glutamate. In some cases, the aminotransferase catalyzes the transamination reaction with glutamate bidirectionally, as indicated in Hgure...2...2, and these enzymes are distributed in many tissues. In other cases, the transamination reactions are liver specific and compartmentalized and specifically degrade, rather than reversibly exchange, nitrogen. For example, when leucine labeled with the stable isotopic tracer 15N was infused into dogs for 9 hours, considerable amounts of 15N were found in circulating glutamine, glutamate, alanine, the other two BCAAs, but not tyrosine ( 18, 19), indicating that the transamination of tyrosine was minimal. Another reason why the entries in Table...2..6 do not show individual steps is that the specific metabolic pathways of all the amino acids are not clearly defined. For example, two pathways for cysteine are shown. Both are active, but how much cysteine is metabolized by which pathway is not as clear. Methionine is metabolized by conversion to homocysteine. The homocysteine is not directly converted to cysteine; rather, homocysteine condenses with a serine to form cystathionine, which is then split into cysteine, ammonia, and ketobutyrate. However, the original methionine molecule appears as ammonia and ketobutyrate; the cysteine carbon skeleton comes from the serine. So the entry in Table.2.6. shows methionine degraded to ammonia, yet this degradation pathway is the major synthetic pathway for cysteine. Because of the importance of the sulfur-containing amino acids (20), a more extensive discussion of the metabolic pathways of these amino acids may be found in Cha.pter..2.7 and Chapter..34. Glycine is degraded by more than one possible pathway, depending upon the text you consult. However, the primary pathway appears to be the glycine cleavage enzyme system that breaks glycine into CO2 and ammonia and transfers a methylene group to tetrahydrofolate (21). This is the predominant pathway in rat liver and in other vertebrate species (22). Although this reaction degrades glycine, its importance is the production of a methylene group that can be used in other metabolic reactions.